Service Costs > How Much Does Dry Cleaning Cost? Dry cleaning is a process of cleaning clothes and other fabrics without using a water-based cleaning solvent. This method is usually used on materials that are too delicate to be washed in a conventional washing machine. It is very common for certain materials to become damaged in a traditional washing machine as they can stretch out, shrink or fade in color. They can also take on the colors of others items washed with them. For this reason, dry cleaning is suggested in many articles of clothing. The Classic Drycleaners, with multiple locations located in Pennsylvania, lists its prices on its website. A shirt on a hanger, for example, will cost $2.70, whereas a tuxedo shirt will cost $3.46. Pilgrim Cleaners, a popular franchise with more than 20 locations, charges close to $10 for pants and about $3.30 for a shirt. Total Care Cleaners compared the costs of popular dry cleaning companies, showing you what each company charged. With dry cleaning, the process begins with the pre-treatment of stains and dirt using a specific cleaning agent. Then, the garments are loaded into a machine to remove the embedded dirt. Once the dirt is removed, the clothes are drained using a centrifugal force until no residual solvent odor can be traced. Depending on the dry cleaning company, services usually provide a full service where the entire garment is cleaned and pressed. Once cleaned, the garments will be hung and placed in a plastic bag covering to protect them from any outside elements in transportation. The time it will take for dry cleaning will depend on the cleaner doing the work and if they do it in house or it’s outsourced. Generally, it’s best to give the dry cleaners two to three days, but if they were able to do it in house, a 24-hour option may be available for a surcharge. 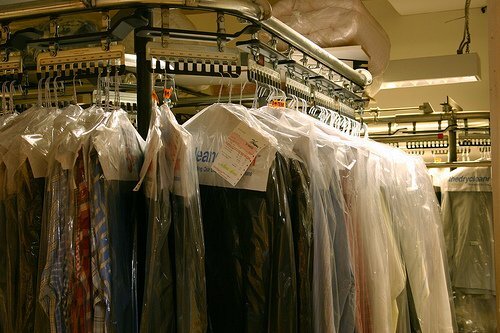 Some dry cleaning companies offer a VIP service, for example, where customers can take advantage of a clothes bag with each pickup and delivery service. Rather than the temporary plastic covering, the clothes bag will be thicker, tougher and will usually have a zipper to fully enclose the garments. These VIP services, if available, will often be billed monthly. Dry cleaners may charge extra for oversized shirts. Many cleaners can deliver and/or pick up your items for a small fee. As long as your location is within 10 to 15 miles, it shouldn’t cost more than $20. Some cleaners may charge an additional fee for different materials such as silk, fur, special knits, pleats, gowns, designer items, cashmere and unique items. Upcharges may also apply for excessive animal hair removal, top brand clothing that requires special handling and/or removing buttons if necessary. Most dry cleaning facilities in the same area use a common contractor, which is usually owned and operated by a few companies. This is the primary reason they cannot promise to deliver your items on the same day as you bring them in. Before dropping your clothes off, ask them how your clothes will be dry cleaned. Take a picture of your clothing before dropping it off. You will find that it is very hard to prove damage if the dry cleaner had done it without these pictures. Many dry cleaners offer coupons online and even in local mailers. Check out Groupon or local dry cleaning websites to see if they have any promotions available. If you plan on going to dry cleaner a few times per month, see if you can take advantage of any recurring customer discounts. The next time you purchase anything fabric related, look for a tag that doesn’t require dry cleaning. Consider dry cleaning some items at home with an at-home dry cleaning kit. These kits, depending on the brand and inclusions, can cost as little as $10 to $25.